I'm not really a wedding crazy person--I didn't get up at 4 a.m. to watch that British wedding, I don't flip through bridal magazines for fun, and I don't have to take tissues with me when I attend a ceremony--but nothing makes me so content as to see my family happy. So when I got my cousin Bill's wedding announcement, I began planning a trip. 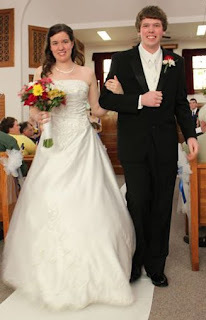 And because I wasn't able to make the last family wedding, nothing was keeping me from this one. 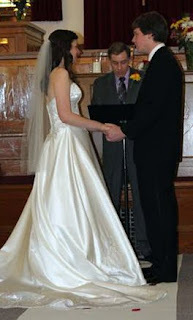 Bill and Susie were married by Susie's childhood pastor in her home-town church in Winnebago, IL. You could tell it was just the quiet wedding Susie wanted, and if the smile on Bill's face was any indication, it was just what he wanted, too. While everyone couldn't make it, the majority of the extended family came to lend their support. Most of us younger cousins were able to make it (my sister is the half-way point of the 21 cousins), and we never seem to be able to spend enough time with each other. A few people had to leave right after the ceremony, but the photographer managed to fit us all into the frame. 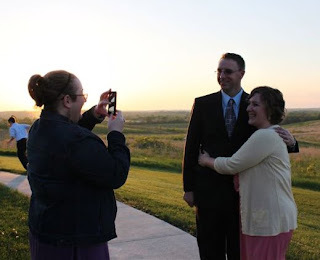 Of course with so many people snapping pictures of the big event, my uncle had to get a picture of me taking a picture. But the sunset sure was beautiful at the forest preserve where the reception was held. So, Bill and Susie, I wish you all the best in your marriage. And remember, there are a lot of people loving and supporting you.